Miniature versions of things are adorable. Don’t you think? Like tiny animals? Or small bottles? Little books and teeny-weeny envelopes? If you like the full-sized version of a particular thing, chances are you’ll go awww when you see the miniature version. I’ll give you an example. You like regular sized cupcakes? Such cute little things, no? 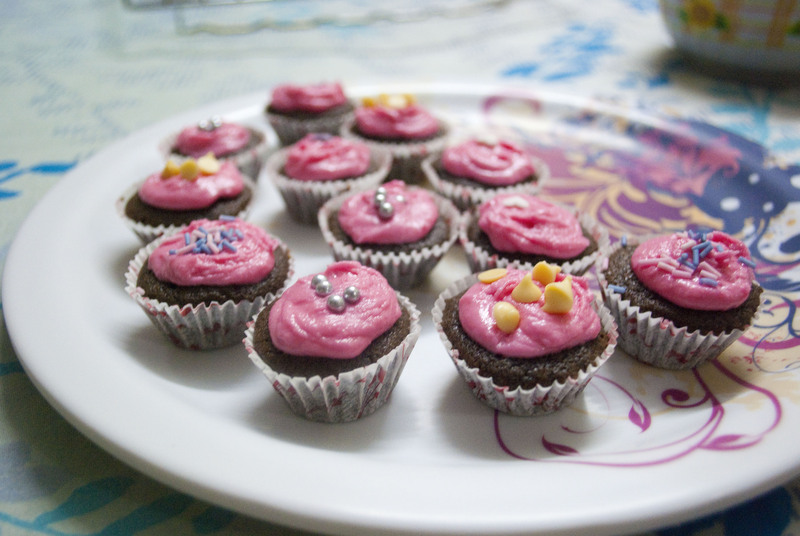 These mini chocolate cupcakes are so pretty, it’s hard to eat them. Perfect for those sudden sweet cravings, and just the right non-guilt inducing size, these babies are delicious. 1. Preheat the oven to 180º C. Mix the flour, cocoa, sugar, and baking powder together in a bowl. Make a well in the centre and add the butter, egg, milk and vanilla. Stir well until everything is combined and you have a glossy, smooth batter. 2. Line a cupcake tray with mini cupcake liners. (I use one 12-holed tray and one 6-holed tray.) Carefully spoon the batter into each liner. Fill each one about two-thirds full. 3. Bake in the preheated oven for 10-12 minutes. Remove from the oven and cool on a wire rack. 1. With an electric whisk, mix the butter and sugar together with the milk and vanilla. Add a few drops of your chosen food colour and mix again. 2. 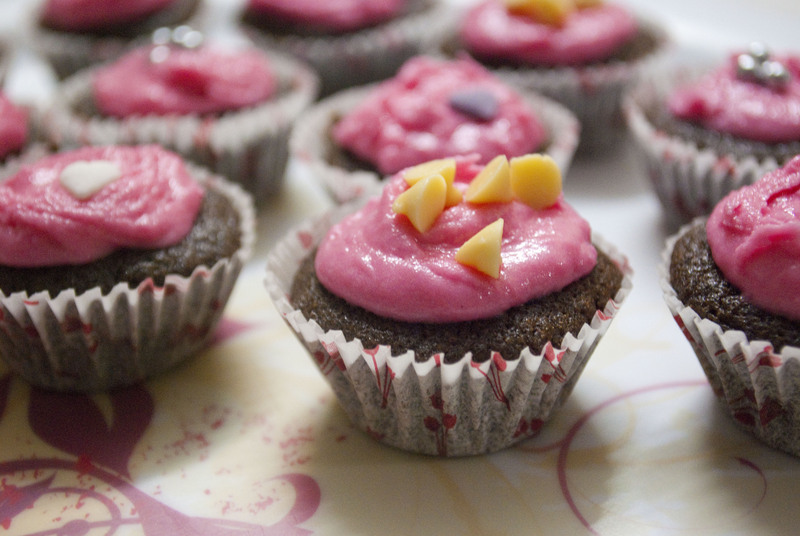 The frosting should be soft and creamy with no lumps. 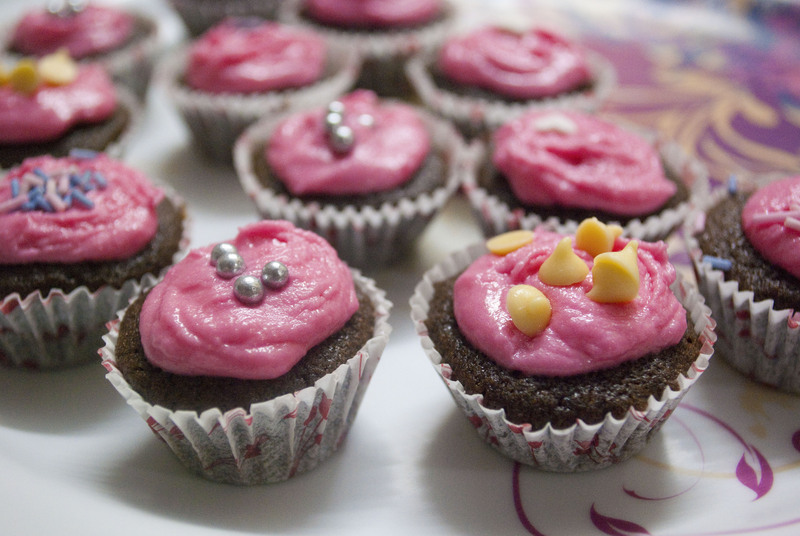 If you plan to pipe with a paper bag, you will need to add more icing sugar to make the frosting stiffer. If you choose to just spoon the frosting onto the cupcakes like I did, it’s nice to have a softer frosting. 3. 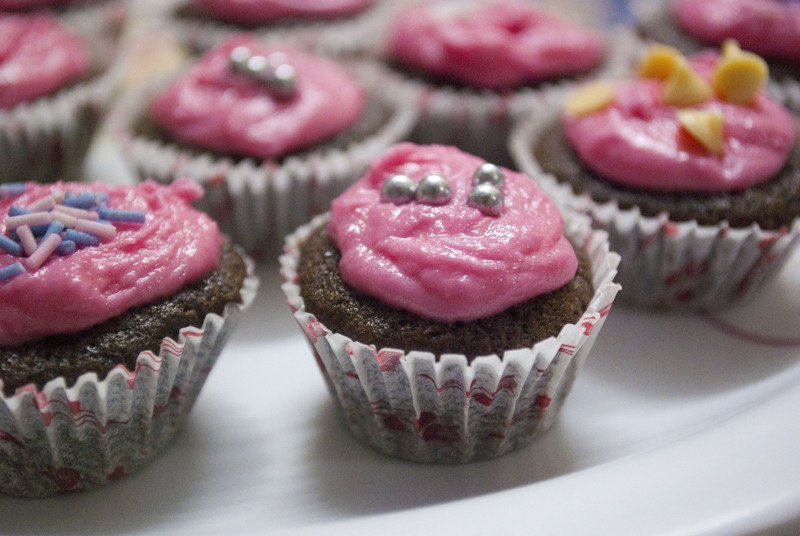 Pipe or top a little frosting onto each of the cooled mini cupcakes. Decorate with sprinkles.